Have you been using the Set-MailboxCalendarSettings cmdlet to configure scheduling settings for resource mailboxes? Wish there was a graphical interface to configure these settings? Christian Schindler, MCT, MCA (Messaging), from Austria points out the little known fact that you can use OWA to configure calendar settings for resource mailboxes. Note, the user accounts for resource mailboxes are disabled by default. You would need to enable the account in ADUC before you try to logon using OWA. With the permission assigned, you can log on to OWA using your account, and open the resource mailboxes using OWA 2007's ability to open additional mailboxes, as shown in the following screenshot. If you look at Options in OWA when logged in as an ordinary mailbox user (that is, not logged on to a resource mailbox), you see Calendar Options. 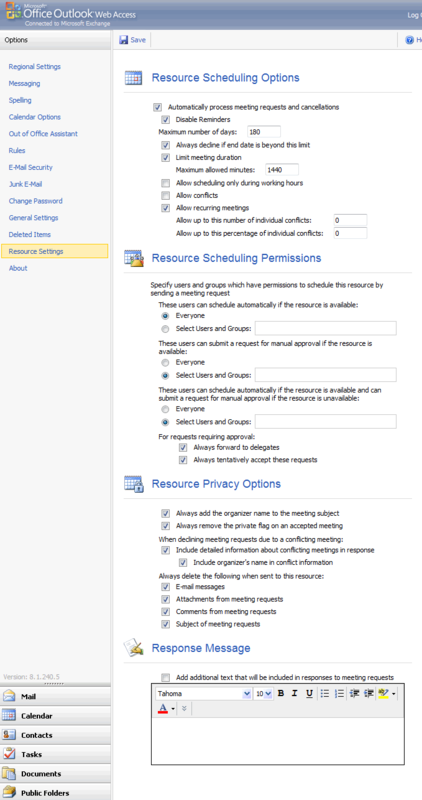 If you log on to a resource mailbox using OWA, you also see Resource Settings as one of the options. 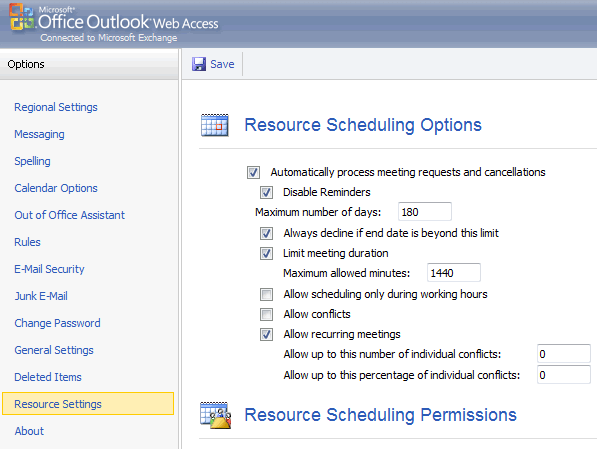 Figure 1: The Resource Settings option is available in OWA when logged on to a resource mailbox. Full size screenshot here.  Not only does this allow you to configure the settings for automated processing of meeting requests, there's also a rich text editor for creating a custom response message. Figure 2: The Resource Settings option also has a rich text editor for creating a custom HTML response message. This rocks!!! Thanks for the great info!!! Your 'alternative' option is the one Microsoft recommends - the en-enabling of a disabled resource account is not 'supported', but it will work. @Anonymous: Thanks for pointing that out. The idea is to disable the account after you're done. But only work in SP1. @Antonio: You're right - this should've been Add-MailboxPermission. Thanks for pointing out - corrected.